Drop garlic through food chute with food processor on, and process until minced. Add cottage cheese; process 2 minutes or until smooth. Add cream cheese, 2 tablespoons Romano, basil, pepper, and egg; process until well-blended. 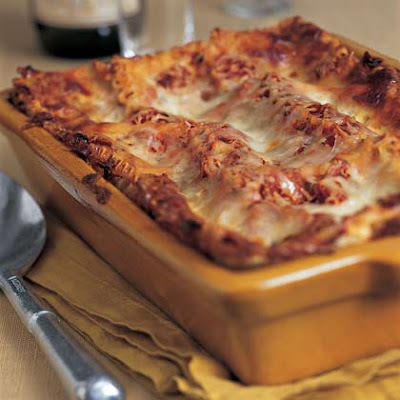 Spread 1/2 cup pasta sauce in the bottom of a 13 x 9-inch baking dish coated with cooking spray. Arrange 3 noodles over the pasta sauce; top with 1 cup cheese mixture, 1/3 cup prosciutto, and 3/4 cup pasta sauce. Repeat the layers two times, ending with noodles. Spread remaining pasta sauce over noodles. Sprinkle with 2 tablespoons Romano and mozzarella.